Webbing Clothes Moth, Tineola bisselliella, along with the Case Making Clothes Moth, Tinea pellionella, are two species of moth that are known to be a pest in stored fabric environments. Larvae of these moths, not the adult clothes moths, cause significant damage, as they will feed on both natural and synthetic fibres. Fabrics that are stained with food or drink, urine, oil from hair and sweat are particularly susceptible to attack and especially items put in storage. These moths prefer dark surroundings and they are not attracted to bright lights. Female moths are unlikely to fly, preferring to hide within creases and folds of clothing. If they need to move, they do so by hopping or running. 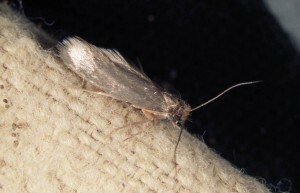 Male clothes moths do have the ability to fly, a feature exploited by pheromone traps. Webbing clothes moths can cause significant and costly damage to antique carpets and upholstery. They can be a major problem for museums and theatres where expensive or irreplaceable items are at risk. The food sources for this pest are diverse. Potential foods could be any feather material, woollens, rugs, felts, hair and furs (including animal mounts and fur garments). It is also reported that this moth will feed on spices, tobacco, hemp and skins.